Mistake #1. I posted my resume at a couple of online job sites like careerbuilders and hotjobs. I recommend that no one does this. Find openings and take the time to apply or send in resumes directly to employers. Next: The Bad guys pulled my information off of my resume – name and phone number and email, which are normal for a resume. The contact me about a job, ask if I am interested. I reply, sure (not the job I want, but meanwhile a source of income). What I get in my email: I got solicited with a “job scam” today. The company is atg-group.net but the same scam by the same scammers has been done as SIDELINEUSA-GROUP.NET See post about sideline here. You will notice the same looking web-page. There is also a post about this scam here. Ahhh – so then I check on Landysh Akhmadullina. The first things to show up on Google are scam alerts for this name and many others. If you check atg-group.net, scam alerts are all over the place. 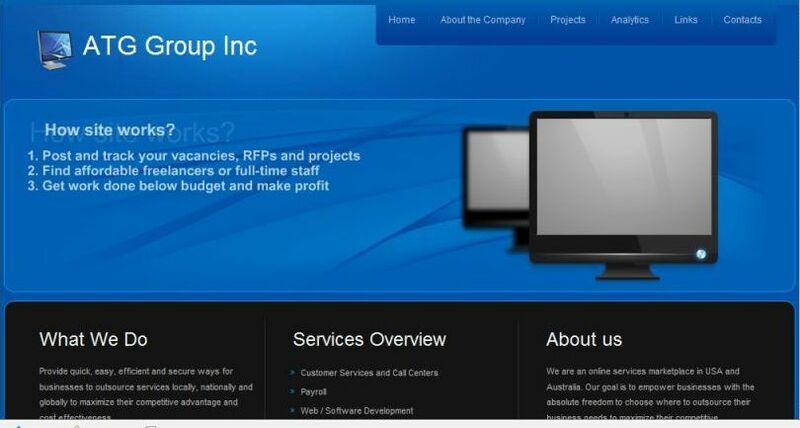 Also the website of atg-group.net and sidelineusa-group.net look identical except for the name. This is what they wanted me to do. They wanted for me to take checks into my account and write money orders to elsewhere. I would collect a 8% fee for processing these money orders. Usually they make the first check or two legit. So, all goes well at first. Then, they crank up the checks so I would think “oh boy more money for me” meanwhile the checks are now forged and after I have already sent out the money orders, I would later discover that the checks are no good and I am left holding an account with minus big bucks. It has happened to many. This scam has already happened to a lot of good people out there. I am really pissed off at scammers who take advantage of people who are looking for work or in similar situations. I face enough problems of my own without these sleaze-balls piling it on. So if you get a similar job offer – or the site looks like above – stay away. If you are so inclined, you may wish to report it to the local FBI office. 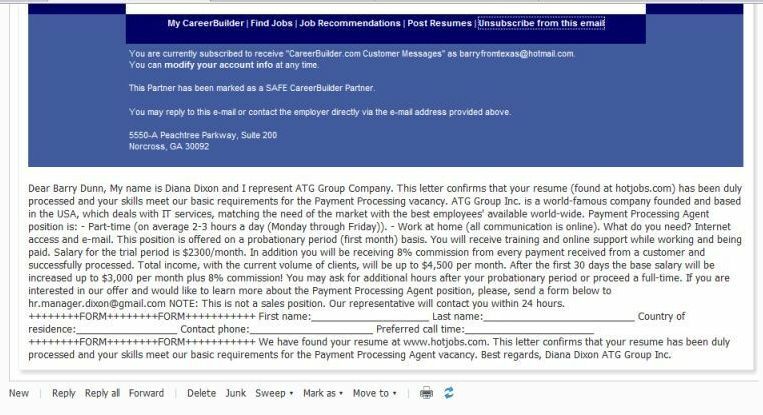 The Email "Looks" Legit The email looks like it comes from careerbuilders.com even though it doesn't. Please do not follow up on this email for your own sakes. I did not bite, so I didn't have any report to file online with the FBI. If I had I would. I did forward the email to my local FBI offcie - so far waiting on an update. Update: Since the posting of this article the site has been shut down. At least it showed a broken link on 12 October 2010. Any other updated information is appreciated! Just got the same offer, went through the same process, bank called me the same day to notify me of fraud money that was deposited in my account. Why did you not report it to the FBI and if you did what did they say? This is the same Scam. 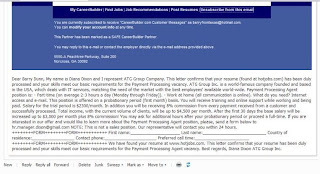 My name is Diana Dixon and I represent ATG Group Inc.
We've reviewed the resume that you posted at careerbuilder.com, and I'm pleased to offer you a chance to apply for our Payment Processing Agent vacancy. We are a large company founded and based in the USA. ATG Group Inc deals mainly with providing IT services to clients within the United States, while recruiting individuals and agencies from all over the world. This is a part-time position with a flexible schedule, requiring you to commit to 2 to 3 hours a day from your home in a telecommuting capacity, staying in contact and receiving all your tasks online. During the training period, you'll be paid $2,300 a month. In addition, you'll keep 8% from every financial transfer processed. Total income, considering the current volume of clients, can be up to $4500 per month depending on your effort and dedication to the training. After you successfully pass the training period, base salary will be increased up to $$3000 per month. Furthermore, you may ask for extra hours or even a full-time job. My goal is to spark your interest. In the present economy, our position offers training, support and a pay scale comparable to other entry level positions that would normally require a traditional schedule of 40 hours per week. I hope you will explore other options, compare, and then contact me with your questions. Please complete a form below with your updated contact information as a part of your return email. We have found your resume at www.careerbuilder.com. This letter serves to confirm that your resume has been duly processed and your skills meet our basic job requirements for the Payment Processing vacancy. I get a lot of these check cashing job offers. I just ignore them. Yahoo HotJobs will eventually merge with Monster.com, maybe then this stuff will stop. Probably we did as they said because it looked extremely legitimate. I mean the page, the e-mails, the employment agreedment. The reason I have this post is to try to warn everyone about the scam. The good news is that the site has been shut down. I am sure they just changed name and location and will be running the same scam with another name. Hi Barry I was the one that posted the anonymous on October 12, 2010 2:24 PM and October 12, 2010 2:27 PM I just wanted to let you know I just received another offer and would like to forward it to you. Supposely its a different company.I just got the e-mail.